This guide (and all following heroic or hard mode encounter guides) will assume that you are familiar with the fight on the normal level of difficulty. You can read my tactics for this encounter here. His bonestorm ability now causes additional damage over time in the form of a bleed effect. We use identical positioning to the normal mode encounter. It is vital that everyone stacks under Marrowgar. This allows for very fast removal of players from the bone spikes without your melee needing to run around the room. When correctly positioned like this, the coldflame will cause no problems in this phase of the fight. One thing to note, particularly when you begin to regroup after a bonestorm phase. As you’re in melee range it’s vital that you do not stand infront of Lord Marrowgar, his saber lash ability hurts. If marking the tanks ensures that your DPS always find the back of Lord Marrowgar then do so to avoid unnecessary DPS or healer deaths. We use heroism as soon as every is in position and burn as much as we can in this first phase. The priority for all DPS should remain the bone spikes. Lord Marrowgar creates a whirling storm of bone! 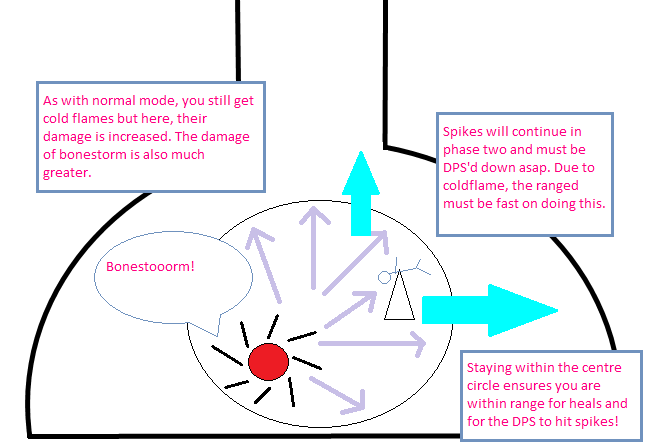 Aside from the increase in damage dealt by Bone Storm and Cold Flame in this phase, there is one primarily difference between heroic and normal modes of the encounter. Throughout phase two on heroic mode, player will still be impaled by the Bone Spikes. As healing will be pushed due to the increase in damage from other sources, it’s vital that the DPS burn these spikes down fast. We make one slight difference to the positioning in the second phase of this encounter from the normal mode. Due to the increased damage taken by the entire raid, healing becomes very pressed. We have a lot of problems in our early tries with people running out of range of healers and thus dying. You will still get coldflame in phase two. 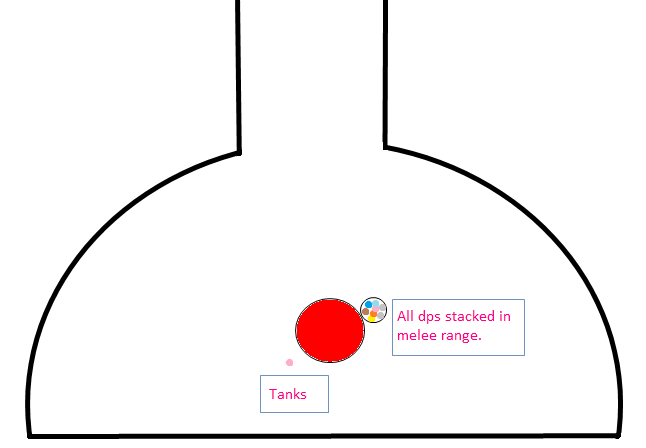 Your melee DPS can’t always be expected to reach the bone spike due to flames and because of this, it is essential that your ranged DPS are fast and bringing down the spikes. As with the normal mode, phase one and two alternate until Lord Marrowgar is dead. As with the normal version of this encounter, no specific totems are required. For elemental shamans that are free to use fire DPS totems, the advantage of this positioning is that you don’t have to worry about range to the boss. 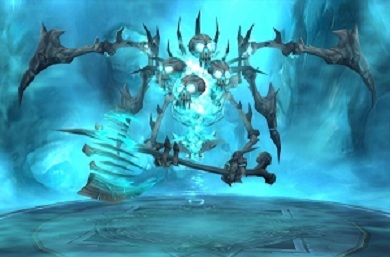 At the time of writing, Decimation have just two more heroic modes left in Icecrown Citadel; Sindragosa and the Lich King. Never the less, this is still the hard mode that causes us the most stress (and annoyance) on a weekly basis. Be aware that while the mechanics barely change, the increase in raid wide damage is considerable and as a DPS, you should be doing as much as possible to avoid excess damage to ease the healer stress.